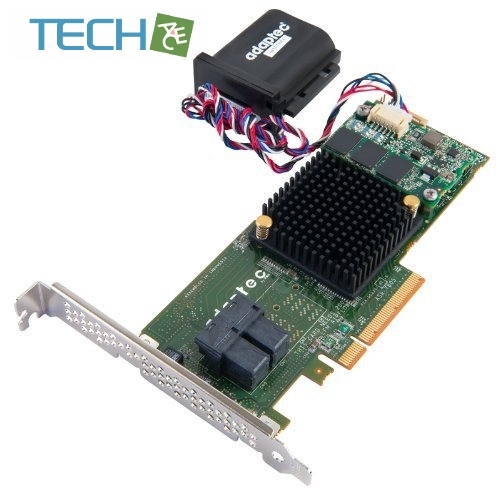 The Adaptec by PMC 7805Q SAS/SATA 6Gb/s PCIe Gen3 RAID adapter provides a low-profile/MD2 form-factor solution, delivers exceptional performance and is ideal for value server platforms. The Series 7 operates at x8 PCIe 3.0 and supports SAS and SATA at 6Gb/s. The Adaptec Series 7 ships with 1024MB DDR3-1333 DRAM. Adaptec’s maxCache 3.0 technology for the 7805Q and 71605Q models utilizes SSDs to improve IOPs in write-intensive applications and reduce latency in read-intensive applications, reaching up to 450,000 IOPS according to PMC. Third-generation PMC Zero-Maintenance Cache Protection (ZMCP) technology uses flash to protect cached data for Series 7 RAID adapters. Levering flash storage for cache protection eliminates installation, monitoring, maintenance, replacement costs associated with lithium-ion battery backup units. The Series 7 includes the Adaptec maxView web interface for monitoring and configuration, which is SNIA SMI-S certified (CTP) and VMware CIMpat compatible for integration with other management platforms.